Available in hardcover, e-book, Kindle and audiobook – read by Luis! BOOK SUMMARY: After the bloody Tomochic rebellion, Teresita Urrea, beloved healer and "Saint of Cabora," flees with her father to Arizona. But their plans are derailed when she once again is claimed as the spiritual leader of the Mexican Revolution. Besieged by pilgrims and pursued by assassins, Teresita embarks on a journey through turn-of-the-century industrial America-New York, San Francisco, St. Louis. She meets immigrants and tycoons, European royalty and Cuban poets, all waking to the new American century. And as she decides what her own role in this modern future will be, she must ask herself: can a saint fall in love? 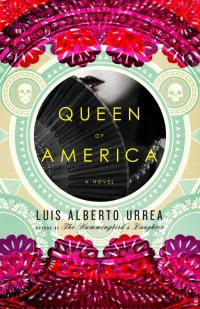 Luis Urrea on QUEEN OF AMERICA: This is the sequel to THE HUMMINGBIRD’S DAUGHTER. It’s a personal favorite because I feel I made some happy forward moves in my writing. It is, by nature of the milieu, different from its predecessor. Yet it still trods the pathways of the former book. You can imagine it this way: 19th century indigenous Mexico offers different magic than, say, early 20th century Manhattan. It goes from a planted, native tale, to the story of immigrants entering not only a new world, but a new century. With miracles. Or: how does a young woman go from Mexican sainthood to her day’s version of pop-stardom? How does one try to be the Madonna, while being Madonna? To read more , visit Luis at http://www.luisurrea.com/. NYC BOOK TOUR DATE: Luis Urrea and QUEEN OF AMERICA are coming to New York on December 14 (Wed) at Word in Brooklyn, NY. (126 Franklin Street, Brooklyn) Come join the party!